Apple released the latest version to its super successful tablet, the iPad2 which went on sale on March 11 in the US. The iPad 2 is expected to be on sale in Canada on March 25th. If you are like me you will be asking yourself, should I stick with the iPad or should I upgrade to the iPad2? And if you will be purchasing the iPad for the first time then you will be wondering which one you should choose. Let’s examine the two versions of the iPad. 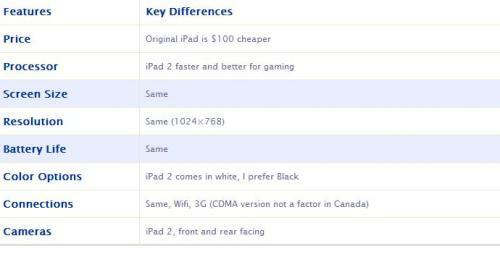 While there are 3 main differences between the iPad 2 and the iPad, the similarities are a lot more common. They both have same screen size and display (1024 x 768), the same storage options, same number of connections (Wifi, Wireless), and they both have the same battery life. So what are the key differences? There are other smaller differences, like the fact that the iPad 2 comes with a faster processor, specifically to support gaming apps, comes with Black AND White (the iPad only comes in Black) colors and its a bit thinner. These differences don’t seem that major to me and the benefits of the faster processor is only seen with intense apps like gaming. If you take a side by side comparison of the specifications for the two products you notice very little differences between them. Finally the iPad currently will not be the main device in my life as I still need a computer, so given this fact most of the advanced features I will use on my notebook computer because it is where I spend most of my time. This also brings in another debate, does the tablet really fit in, but that’s another blog? In short, the iPad will be sold at a discount to the iPad 2 ($100 less), comes in the same package, has most of the features of the iPad 2 and the additional features which do come on the iPad 2, I’m not buying. So for me the upgrade question is simple, not now. Yale Holder is co-founder of myCELLmyTERMS, a Toronto-based company that helps cell phone users negotiate wireless plans with independent dealers.